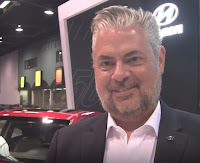 The fifth-generation, all-new 2018 Hyundai Accent, powered by an updated 130 horsepower 1.6-liter GDI Dual-CVVT 4-cylinder engine with standard 6-speed manual or optional 6-speed automatic transmission, made its U.S. debut at the Orange County Auto Show in Anaheim to kick off the weekend exhibition across the street from Disneyland. A six-airbag system is standard, along with Electronic Stability Control, Vehicle Stability Management, Traction Control and ABS. Pricing will announced closer to the November on-sale date. Click here to view the interview with Hyundai Product Planning Manager Michael Evanoff. The all-new 2018 Kia Stinger powered by a 255 horsepower 2.0-liter twin-scroll turbocharged four-cylinder Theta II engine propelling the Stinger from 0-60 mph in 5.9 seconds or an available 365 horsepower 3.3-liter twin-turbo V6 Lambda II engine mated to a second-generation eight-speed rear-drive automatic transmission to challenge the Audi S5 Sportback, BMW 440i Gran Coupe, and Infiniti Q50. The Stinger GT accelerates to 60 mph in 4.7 seconds to a governed top speed of 167 mph. The Stinger is planned to go on sale in the U.S. in December. The all-new, fifth-generation Lexus LS flagship sedan is powered by an all-new 60-degree 416 horsepower twin-turbo 3.5-liter V6 engine specifically for the new LS mated to a 10-speed automatic transmission. In RWD form, the new LS 500 sees a 0-60 time of 4.6 seconds. The new LS goes on sale in the U.S. in February, starting around $75,000. The LS Hybrid has a 354 horsepower Atkinson-cycle 3.5-liter V6 gasoline engine with two electric motor/generators and uses a compact, lightweight lithium-ion battery enabling the LS 500h to accelerate from 0-60 mph in 5.1 seconds (RWD). There's an LS 500 F SPORT RWD model (shown above) coming as well. The 2018 Panamera Turbo S E-Hybrid Sport Turismo delivers a total output of 680 horsepower derived from the 918 Spyder with a 136 horsepower electric motor and a 550 horsepower twin-turbo V8 engine delivering a zero to 60 mph time of 3.2 seconds to a top track speed of 192 mph. The electric motor is powered via a liquid-cooled lithium-ion battery with an energy capacity of 14.1 kWh. Charging time is less than three hours with a 240 V, 40 amp connection to an optional 7.2 kW on-board charger. The 2018 Porsche Panamera Turbo S E-Hybrid Sport Turismo is available to order now and is expected to reach U.S. dealers in Spring of 2018. The base MSRP is $189,450 (including $1,050 delivery, processing and handling fee). The Volvo XC40 SUV, the first model on Volvo Cars’ new Compact Modular Architecture, at launch will offer the T5 all-wheel drive Momentum trim and will start at $35,200. In summer 2018, a T4 front wheel drive will be introduced starting at $33,200 while more powertrain options, including a hybridized as well as a pure electric version, will be added later. Production of the new XC40 starts in Volvo Cars’ plant in Ghent, Belgium in November. The all-new, fourth-generation 2018 Kia Rio sedan and 5-door hatchback, powered by a 130 horsepower 1.6-liter GDI four-cylinder engine and offered in LX, S and EX trim levels, has been lengthened to 172.6 inches (from 172.0 inches) and the Rio 5-door is now 160.0 inches long (from 159.4 inches) on a longer wheelbase of 101.6 inches (from 101.2 inches) and more upright A-pillars. The sedan and 5-door are also lower and wider compared to the outgoing model with the rear now more upright thanks to shorter overhangs and thinner, more expressive taillights. Like the front-end, the rear view of the car is wider. The 2018 Kia Rio starts at $13,900 (excluding destination and handling) for the LX sedan and $14,200 for the LX hatchback and is expected to arrive in Kia retailers beginning early October. The 2019 Mercedes-Benz S560e sedan's hybrid drive system combines the 362 horsepower V6 spark-ignition engine with an electric output of 90 kW and is mated to the third-generation hybrid transmission based on the 9G-TRONIC PLUS automatic transmission with the torque converter, clutch and electric motor housed in the hybrid drive unit. The S560e has an approximate all-electric range of 25 miles and despite the battery size remaining unchanged, the new lithium-ion battery has an increased rated capacity of 13.5 kWh. The 2019 Mercedes-Benz S560e Sedan is expected to go on sale in the U.S. in mid-2019. The Genesis G70 luxury performance sedan, offered in ten exterior colors and powered by a choice of a 365 horsepower turbocharged 3.3-liter gasoline V6, a 249 horsepower 2.0-liter turbocharged gasoline I4, or a 199 horsepower 2.2-liter I4 diesel engine joins the G80 and G90 in Hyundai's luxury Genesis brand. Forward Collision-Avoidance Assist, Highway Driving Assist, Blind spot Collision Warning and Driver Awareness Warning have been added as part of the ‘Genesis Active Safety Control’. When the driver’s body information is inputed into the smart posture control system, it automatically adjusts the seat, steering wheel, outside mirror and heads-up display to the optimal position. Overseas product specifications in markets including North America are planned to be announced in early 2018. The 2017 Volkswagen e-Golf fully-electric vehicle offers a longer EPA-estimated range of 125 miles on a single charge, 50% more than its predecessor and the starting price is $31,315 (including $820 destination charge). The 7.2 kW on-board charger is now standard on all trims, which enables the battery to be charged in less than six hours at a 240V charging station. The electric motor now develops 134 horsepower compared to 115 horsepower on the 2016 model. Overall fuel economy has improved to an EPA estimated 126 MPGe for city driving, 119 MPGe highway for a combined city/ highway at 119 MPGe. There's an e-Golf Limited Edition with DC Fast Charging capability, V-Tex leatherette seating surfaces, and Park Distance Control (ParkPilot), with a new feature called Maneuver Braking (arriving late in the model year), which can help driver avoid or mitigate the effects of a collision with stationary objects while parking. The e-Golf SEL Premium offers an optional Driver Assistance package ($1,395), including the 12.3-inch Volkswagen Digital Cockpit instrument cluster, Adaptive Cruise Control, Forward Collision Warning with Autonomous Emergency Braking and Pedestrian Monitoring (Front Assist), Lane Assist, Blind Spot Monitor with Rear Traffic Alert, Park Assist and Light Assist. (Late availability for the Driver Assistance Package). The seven-passenger 2018 Nissan Pathfinder starts at $31,765 (including $975 destination and handling charge) topping out at nearly $45,000 and is offered in 2-wheel-drive and 4-wheel-drive configurations, and in S, SV, SL and Platinum grade levels. New features include standard Automatic Emergency Braking, an enhanced Midnight Edition appearance package and a Rear Door Alert system to help remind Nissan owners to check the rear seat by using a series of distinctive honks as the driver is walking away from the vehicle. The 2018 Nissan Pathfinder is now on sale. The high performance Hyundai i30 N, built on the new generation i30, powered by a 2.0-liter turbocharged engine available with the standard 247 horsepower or the Performance Package 271 horsepower, is Hyundai Motor’s first high-performance car under the N line-up inspired by motorsport. The Hyundai i30 N made its debut at the 67th International Frankfurt Motor Show but will it come to the U.S.? The new 2018 Maserati Ghibli with GranLusso (above) and GranSport trims are distinguished primarily by the restyling of the front and rear bumpers. The Ghibli GranLusso has an enhanced exterior finish and Ermenegildo Zegna silk upholstery while the Ghibli GranSport reflects Maserati’s racing heritage displaying sportier exterior design and interior contents. The top-range Ghibli S and S Q4 versions now deliver 424 horsepower. The new Ghibli has adopted the Integrated Vehicle Control system, which helps to prevent vehicle instability and the introduction of the Electric Power Steering improves the car’s handling and comfort. 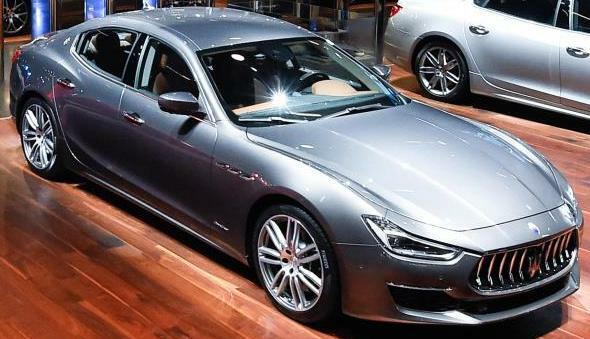 The new Advanced Driving Assistance Systems are available as an option in the Ghibli. In addition to the existing features, they now include active functions like Highway Assist, Lane Keeping Assist, Active Blind Spot Assist and Traffic Sign Recognition. The 2019 Porsche Cayenne Turbo, powered by a 550 horsepower twin-turbo 4.0 liter V8 engine with Standard Porsche Traction Management all-wheel drive that works with the new eight-speed Tiptronic S automatic transmission, drives zero to 60 mph acceleration in as little as 3.7 seconds when equipped with the optional Sport Chrono Package toward a top track speed of 177 mph. The new lightweight chassis helps improve driving dynamics versus its predecessor and the combination of a new three-chamber air suspension with the Porsche Active Suspension Management active shock-absorbers extends the range considerably. By using three air chambers per spring strut, the chassis is able to map a wider range of spring rates than the previous system could, allowing for improvements in both comfort- and performance-focused settings. 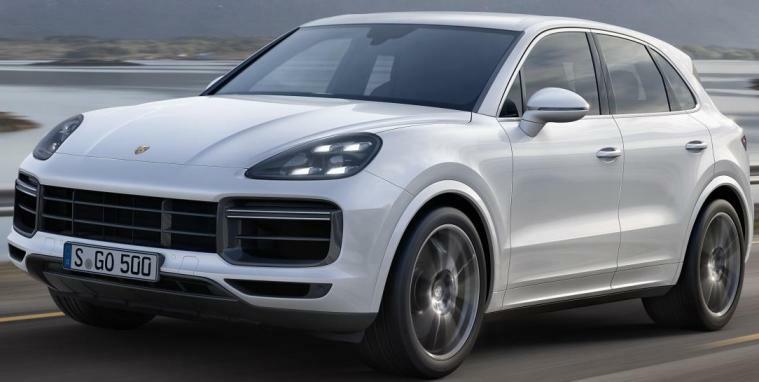 With six selectable height levels, the ground clearance can be manually adjusted to suit the off-road terrain.The new 2019 Cayenne Turbo will be available for ordering in the U.S. market in December, with arrival at dealers in Fall 2018. MSRP is $125,650 (including $1,050 for delivery and processing). The Land Rover Discovery SVX, powered by a 518 horsepower supercharged 5.0 liter V8 engine mated to an eight-speed automatic transmission with twin-speed transfer box, is designed to reward off-road driving enthusiasts with suspension modifications and features including Hill Descent Control, Electronic Traction Control, Adaptive Dynamics, Dynamic Stability Control, All-Terrain Progress Control and variable ratio electric power-assisted steering. 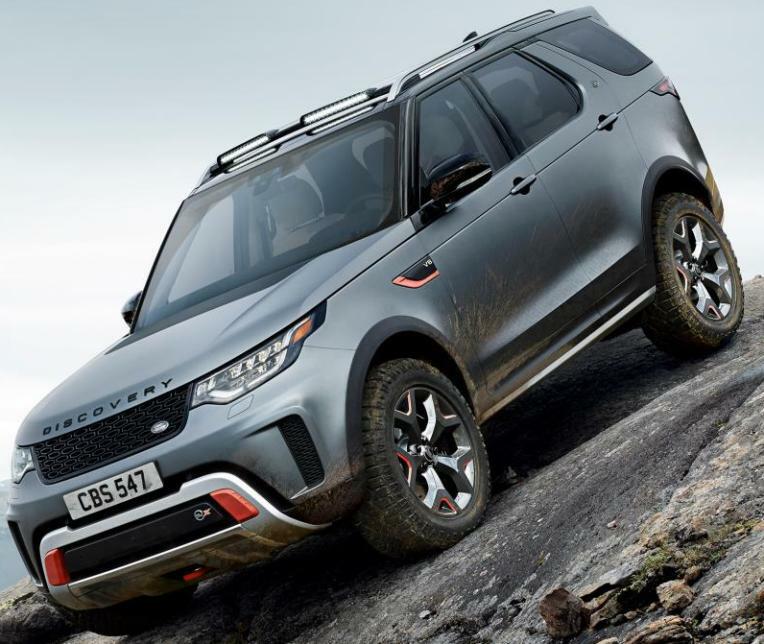 The Land Rover Discovery SVX is equipped with a Pistol Shifter for gear selection in off-road manoeuvres and active center and electronic rear locking differentials which work with the specially tuned Terrain Response 2 system to optimize traction on all surfaces. The Land Rover Discovery SVX will begin production next year. The 2018 Nissan LEAF EV with a 150-mile driving range will go on sale in all 50 states in early 2018 for $30,875 (including $885 destination charge), less than the 2017 model. New features include ProPILOT™ Assist, a "hands-on" system which reduces the amount of driver acceleration, steering and braking input under certain driving conditions. e-Pedal lets drivers start, accelerate, decelerate and stop by increasing or decreasing the pressure applied to the accelerator. When the accelerator is fully released, regenerative and friction brakes are applied automatically, bringing the LEAF to a complete stop, even on uphill slopes, until the accelerator is pressed again.